Palm Springs is delighted to welcome a host of new vibrant hotels to the city, as the desert oasis continues to strengthen its credentials as a haven for those looking for retro cool vibes and 360 degrees of annual sunshine. From familiar hotel brands such as Andaz and Dream to smaller boutique hotels, such as the Infusion Beach Club, the new additions perfectly complement the city’s already renowned hotel product offering. Having celebrated in a soft opening this month and with the full grand opening expected in September, Infusion Beach Club is perfect for those looking for an intimate boutique hotel in Palm Springs. Previously known as the Monroe Hotel, the property has undergone an extensive two-year renovation and redesign to bring a whole new guest experience to the 62-room hotel. Featuring stylishly decorated rooms with warm wood accents and plush club furnishings and a 5,500 square-foot pool area, boasting spectacular mountain views, a pebble beer garden, turf daybeds and electronic cabanas with louvered roofs, the hotel is perfect for relaxing after a day exploring the city’s nearby attractions and new downtown area. 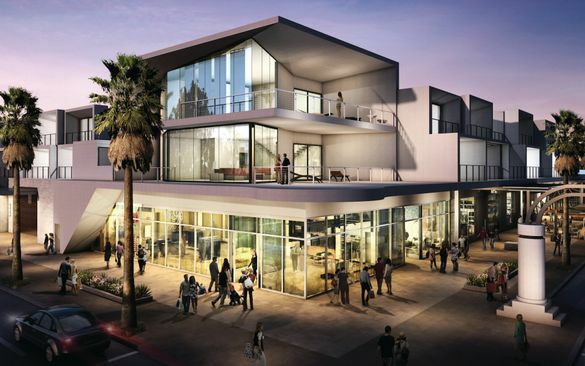 Bringing 169 rooms, 30 private residences, multiple restaurants and bars, as well as over 10,000 square feet of flexible meeting space to the corner of Amado and Avenida Caballeros, Dream Palm Springs is set to open in late 2019. Focusing on the Californian dream and the cool, yet relaxed, dream of the desert, the design of the hotel honours the idealism of modernism, with an abundance of glass enhancing interaction with the landscape. Key to Dream Palm Springs experience is its culture of connection and kindness, where all walks of life can come together effortlessly. With materials authentically and honestly used in their natural state, the hotel will create a relaxing, cool retreat in the city. Creating inspiring experiences and immersing guests into the local culture, the Andaz Palm Springs will be located in the heart of Palms Springs’ downtown and on the doorstep of the city’s vibrant uptown design district, perfect for those wanting to explore the city’s trendy boutiques, award-winning restaurants and renowned galleries. Due to open in 2019, the 150-room, 13-suite hotel will be built as a collection of small buildings and guestroom bungalows and feature two outdoor pools, garden areas on an elevated patio terrace, full-service spa and signature restaurant. Offering panoramic views of the San Jacinto Mountains and Palm Springs, Andaz Palm Springs is set to bring a new, sophisticated urban experience to the city. Andaz Palm Springs, Dream Palm Springs and Infusion Beach Club are just three of the new hotels the city will be welcoming over the next few years. With even more boutique, luxury, affordable and big names set to open in the city, there has never been a better time to explore the renowned city of cool. One hundred miles east of Los Angeles, Palm Springs is a desert playground with year-round sunshine, blue skies and stunning natural beauty. Nestled beneath California’s San Jacinto Mountains, the city is famed for its Hollywood legacy, Native American heritage and huge collection of mid-century modern architecture. The desert oasis boasts a wealth of adventurous hiking trails and historical canyon tours, as well as chic boutiques, world-renowned golf courses and unique experiences, including the chance to stay in the former homes of Marilyn Monroe and Elvis Presley. For more information see www.visitpalmsprings.com.